Our number one asset is our people. All members of our sales force have experience in laboratory work, with educational backgrounds ranging from Master of Science to Ph.D. This gives them a unique understanding for our clients’ needs and the ability to offer qualified, relevant help. Information and knowledge is commonly shared within the company and helps quality and improvement. We find the product that is right for your research - at the best possible price. Under the hashtag #byyourside, we will now be presenting our team for you to get a chance to get to know us even better. Heikki has an engineering education (MSc) from Teknillinen korkeakoulu (nowadays Aalto University). He has 32 years experience in sales of medical devices, instruments and reagents to hospitals and Medical Research Units. 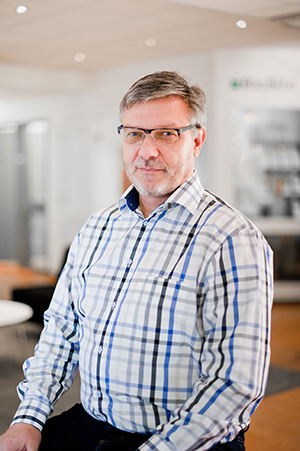 Heikki joined Nordic BioSite in October 2009 as Area Manager for Finland, Estonia, Latvia and Lithuania. In these countries he is your primary contact and is, together with our support team, happy to help you with any questions you may have. From August 2012 he has also worked part time as Test Facility Manager in our GLP laboratory BioSiteHisto Oy in Tampere. If you would like to get in contact with Heikki, or someone else in our great team, click here.